Designated as the National House of Prayer, the Episcopal Washington National Cathedral was established in 1893 through a charter from the US Congress. Construction started in 1907 and completed only in 1990. 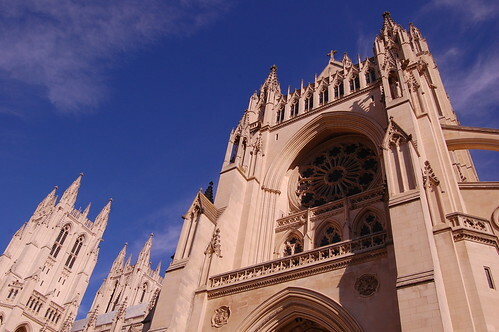 It is the second largest cathedral in the US, the fourth tallest structure in Washington DC, and the sixth largest Gothic cathedral in the world. Masses for 3 state funerals were held in the cathedral namely that for Dwight Eisenhower, Ronald Reagan and Gerald Ford while another one --- Woodrow Wilson --- is interred there. Read my blog entry on Washington DC at Shooting Churches, Eating Noodles.